Today, there are plenty of fitness apps floating around on the App Store. But, which latest fitness app of the current 2018 year is going to be a hit can’t be decided. It totally depends on the app as well as the users and about how convenient the app is! As fitness has become an integral part of people nowadays, one can’t neglect it. Moreover, it’s very important about how the people are staying fit and want to achieve their goals besides their busy life. People like to do workouts and include in their daily routine job, whether they are outside the town, staying at home or working. Because, it doesn’t matter what clothes you’re wearing, how much money do you earn; the only thing that matters is what do you eat and how you stay fit? As you know that, traditionally all the gyms require a membership which isn’t possible for all the people. However, there are a lot of other options in the market and one of them is Esquared. It’s a unique app which offers you different kind of workout classes and gym sessions without needing a membership at all. You only need to pay as you go to the gym for each class. You can book your classes and book a time slot that suits you for the workout. Once you download the Esquared app, you need to install and then Sign Up for proceeding further. You’ll see there a map provided on the app which lets you search for the gyms near your location based in London only. You can book various classes and sessions such as Yoga, Pilates classes, Barre classes, Dance classes, Boxing classes, Swimming classes, Resistance Interval Training classes and HIIT classes, etc. You don’t need any gym membership at Esquared. All you need is to book the class you’re interested in and get a gym pass for a 2-hour session in a couple of taps. Then you’ll receive a check-in code which you need to show on the arrival at the gym. The best part of Esquared is that you can choose your venue and timings that suits you the best. You can invite your friends and have fun with them. So, whenever you book your exercise class or a gym workout session, you can also send an invitation for others to join you. In a few clicks, you’ll all be trained together. When you’re finished with your session, showered and back to life on the outside, always rate your experience about how was it? Esquared has been developed by the Esquared Technologies Limited. It requires iOS 10.3 or any later versions of the Operating System and has been compatible with the iPhone, iPod or iPod touch. You can get the app from the iTunes Store for absolutely free of cost. Give it a try now! 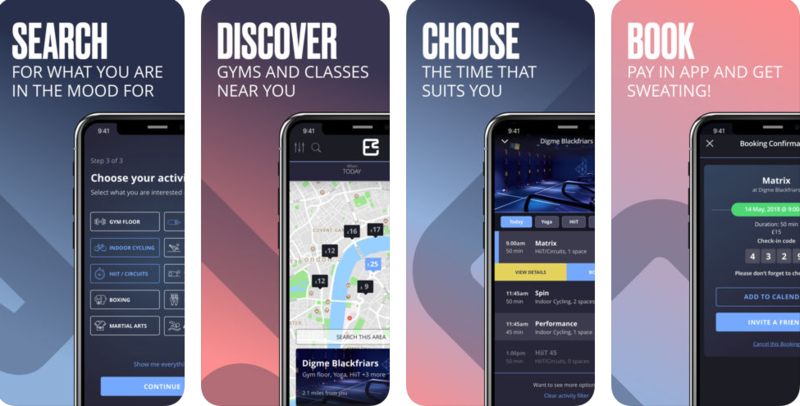 Pros: pay for each session; no membership needed; free to download; effortlessly invite friends and get trained together; a lot of varieties of classes; flexible timings; so many venues available; easy to use app; quite useful for the new gen.